Authors: van Oirschot, P, Nelemans, G., Toonen, S. et al. The halo of our Galaxy is the oldest part. As such, it contains clues to the initial formation and evolution of the Galaxy. To understand these things, astronomers frequently try to understand the star formation history (SFH) and the initial mass function (IMF) of the halo. The SFH tells the rate at which stars were born. The IMF tells the distribution of initial masses for newly formed stars. By knowing the rate at which stars formed and what their initial mass distribution looked like, astronomers can simulate the evolution of these stars to try and match what we see today. The authors of this paper specifically look at various SFHs and IMFs to try and match the distribution of white dwarfs to the observed value. White dwarfs were used because they are the end result of stellar evolution for most stars and have been used before to measure the age of the Galaxy and the universe. Results from these models were then compared to recent results from the SuperCOSMOS Sky Survey, which found 93 white dwarfs in the halo. Figure 1: The white dwarf luminosity function for multiple IMFs (top) and SFHs (bottom). From Figure 5 of the paper. Each color has two lines corresponding to a different normalization of each function. The black line shows the observed distribution of white dwarf stars. A variety of inputs were chosen for the SFH and the IMF to produce different results. Three different IMFs were tested along with three different SFHs. The three SFHs chosen were based on the observational indication that the majority of halo stars are old and formed between 10 and 13 Gyr ago. One SFH had a burst of star formation 13 Gyr ago. Another had a burst of star formation 10 Gyr ago. And the third had continuous star formation between 13 and 10 Gyr ago. These models were then evolved with a population synthesis code called SeBa. Once stars had evolved to become white dwarfs, a different evolution code was used. These cooling models describe how white dwarfs cool over time based on their mass, radius, temperature, and composition. This allowed the authors to compare the distribution of white dwarfs stars in their simulation to what is observed. Figure 1 shows the results of the modelling for the different IMFs (top) and SFHs (bottom). The y-axis here is the white dwarf luminosity function, the number of white dwarfs per cubic parsec per bolometric magnitude. 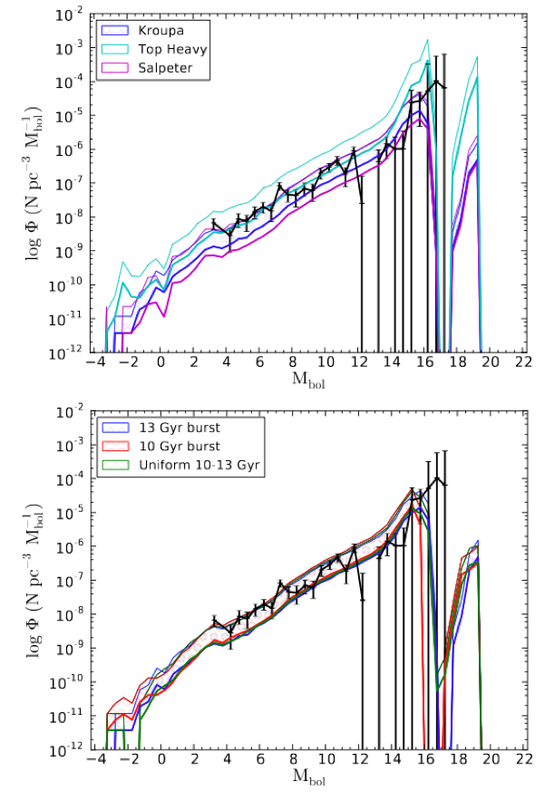 The black line on both plots shows the observed distribution of white dwarf stars. The differences in the IMF are largest on the faint (right) side of the plot. The SFH containing a burst of star formation 13 Gyr ago is slightly favored over the model with a burst of star formation 10 Gyr ago and the model with continuous formation between 10 and 13 Gyr. Finding more white dwarfs in the galactic halo will further constrain the SFH and IMF. This is where Gaia will be enormously useful. Gaia, which launched just last year, is a telescope designed to look at around one billion stars over five years. In the models from this paper, Gaia has the ability to detect around 1500 halo white dwarfs. The discovery of this many white dwarfs, an order of magnitude more than those currently known, will help to rule out some of the considered IMFs. The SFH depends most strongly on the faint end of the white dwarf luminosity function. As Gaia will find fewer of these, it is much more difficult to constrain those models. 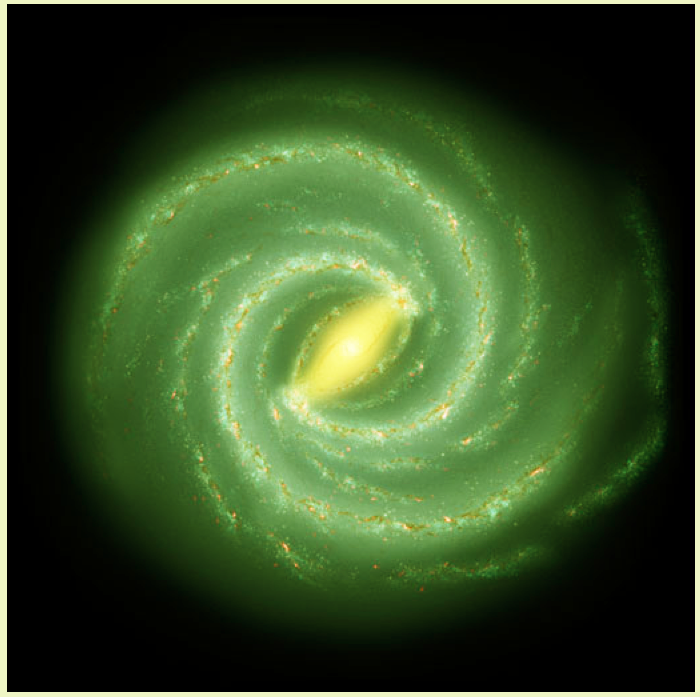 Whatever results Gaia helps find, they will help astronomers understand much more about the history of the Galactic halo and the evolution of white dwarf stars.